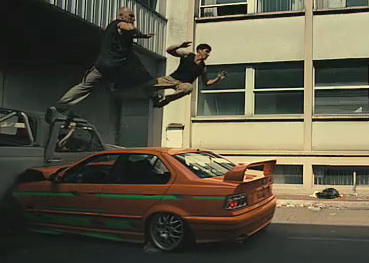 Stylish, kinetic parkour-flavored action that's light on realistic plot and a trifle too by-the-numbers, but when the payoff for trying too hard to make the heroes and villains make sense is making the effort to get the stunts and fight scenes right, well ... that's OK by me. The acting chops of the leads made focusing on their physical prowess a wise choice; not that they were terrible, just limited, and I bet they could both do better. I didn't know either David Belle's or Cyril Raffaelli's names before watching this, though Rafaelli looks familiar ... oh, Live Free or Die Hard, that's why. Now that I know what I've been missing the sequel gets bumped to the top of the DVD queue on Netflix and I'll be looking for their other movies.